Getuk is a traditional Javanese dish (more like for snack or dessert). Therefore there are couple varieties of getuk – based on the main ingredients. Besides Cassava, can be also made from sweet potato (Indonesian known as ‘ubi jalar’), taro (known as ‘talas’) or banana. They are easily found in Central Java and East Java. You can find them on the traditional market. One of the popular getuk is Getuk Lindri which is made from Cassava. The cassava is peeled, boiled and mashed. Then it is mixed with grated coconut and small amounts of salt. Sugar can also be substituted with palm sugar to give it brownish color and more distinctive taste. The shape is unique and usually colourful. It is shaped by grinding the cassava dough using clean meat grinder then cut into small pieces (about 5 cm). Back to my childhood time, there was a getuk lindri seller that goes around the neighbourhood. They were very cheap and delicious. 1. Bring to boil sugar, vanilla sugar and water until the sugar dissolved. Cool it off. 2. Steam the cassava until cooked and soft. 3. Remove cassava from steamer and while it is still hot, mash with butter until it’s smooth. I used potatoes masher, you can also use a grinder. 4. Then slowly add the sugar water and continue mashing until the dough is really smooth. 5. 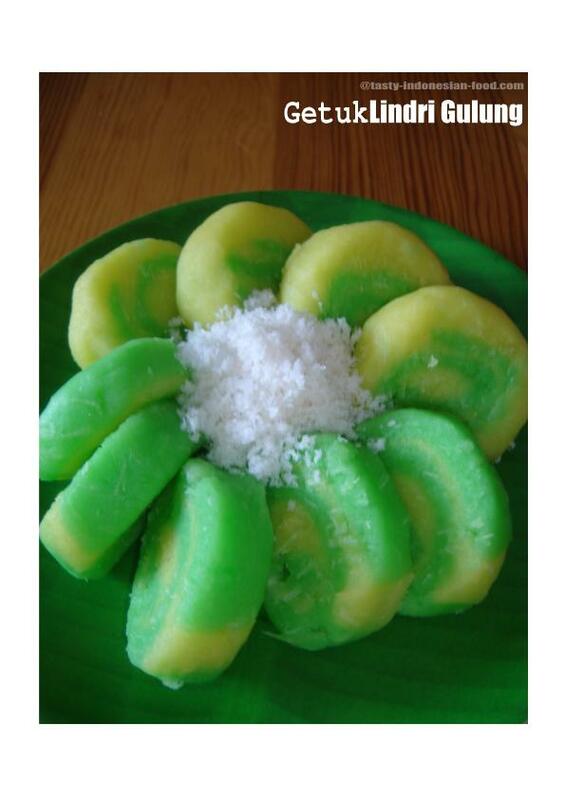 Divide the cassava dough into 2 (or more if you wish) and add the food colouring to each. 6. Prepare a plastic to roll it about 3 cm thin. Then stacking one to another and roll. 7. Cut the dough as you desired then garnish with steamed grated coconut.